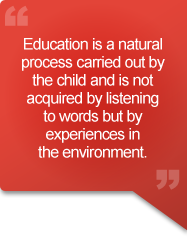 The Montessori philosophy of education is to ‘educate the whole child’. All children by nature are generally inquisitive and curious and this is the best time to learn; not by being formally taught, but by being encouraged to explore for themselves. Children need the free choice of activities and materials and the time in which to work with them; thereby developing their own level of concentration and skills, at their own pace. Montessori children learn how to be self-motivated and independent, with a sense of respect for themselves, others and their environment. The Montessori Method of education will provide your child with a foundation of skills, upon which others can build. 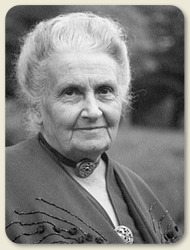 Dr Maria Montessori (1870 – 1952) has been referred to as "the doctor who revolutionized the education systems of the world." Born on 31 August 1870 in Chiaravalle, Eastern Italy, Maria Montessori never excelled as an academic pupil, but she did develop a driving ambition. Her own experiences of her school life made her vow that she would never enter the career of teaching. At the age of 26 she received her degree in medicine and it was through her work as a Doctor that she developed, what is today referred to as, the Montessori Method. Through her work with handicapped children, she devised and developed the Montessori materials which can be seen in today's Montessori Nurseries throughout the world. She observed that children learn through their senses and developed these 'sensory materials' to facilitate the children's learning. She was one of the first educators to dispense with the more formal style of teaching. She introduced child sized furniture and child sized equipment into the classrooms. She was passionate about developing the child's sense of independence and creating an environment in which each child would thrive. She firmly believed that children wanted to learn, had a great need for order and tidiness and thus established the Montessori classroom of today.